Last year’s “repeal and replace” fight in Congress underscored how deep—and deeply confusing—disagreements over health care policy can be. And if two truisms of social reform policies—that all progress is incremental and durable policies are bipartisan—still hold, then what does that portend for health care policy in the US? David Jones, assistant professor at Boston University School of Public Health, followed up last year’s Milbank Fund–supported work on health care values with a trip to two states in the heartland of America—far from the coasts and from the noise of Washington. 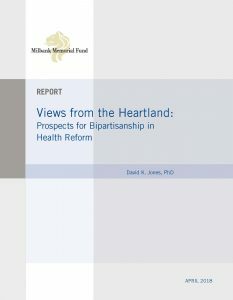 He wanted to know—in states like Kansas and Colorado where budgets have to be balanced and constituents’ phone calls answered—what Republican and Democrat legislators were concerned about when it comes to health reform.